Through its Facilities Committee, the BAC focused on Ward 4. The committee conducted a "rolling" meeting on Oct. 21 to survey parts of the ward and make recommendations to increase safe travel for bicyclists and pedestrians. 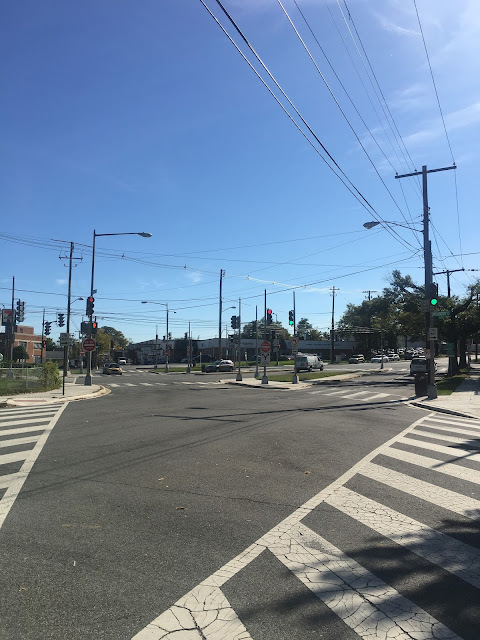 The ride visited the convergence of Blair Road, Kansas Avenue, North Dakota Avenue and Peabody Street NW to suggest ways to redesign this complicated intersection. Blair Road, Kansas Avenue, North Dakota Avenue and Peabody Street NW. Photo by Susan Balding. The ride surveyed streets that would comprise part of the Metropolitan Branch Trail, topic of discussion at recent Advisory Neighborhood Commission 4B meetings. To open communication with ANC 4B commissioners, Facilities Committee co-chair Jeanie Osburn invited the commissioners to attend the ride. The BAC sought to give commissioners a first-hand understanding of factors that affect bicyclist safety and the rationale behind the BAC's position on the routing in question. 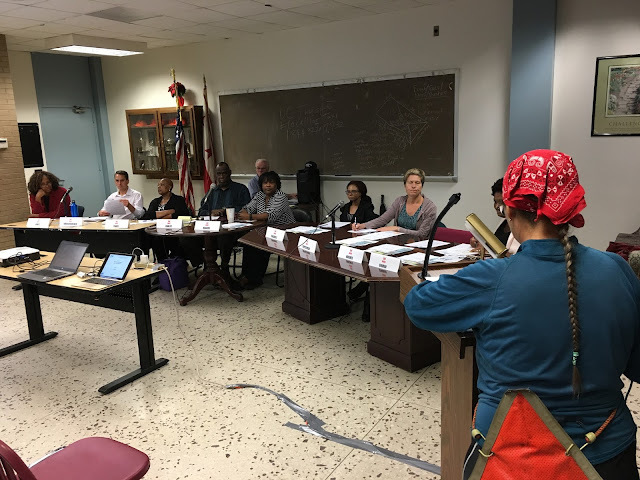 Osburn testified at the Oct. 23 ANC 4B meeting to voice the BAC's opinion and answer commissioners' questions. Speaking individually, Legislative Committee chair John Serrao also testified. After lengthy testimony and debate, the ANC voted for a plan that omits key BAC recommendations. The ANC will revisit the issue at future meetings. Facilities Committee co-chair Jeanie Osburn testifies before ANC 4B. Photo by John Serrao. At its Oct. 17 meeting, the Legislative Committee discussed snow removal policy, among other issues. The committee submitted official comment to the D.C. Council Committee on Transportation and the Environment, which held an Oct. 16 roundtable on the topic. The BAC reinforced its support for the Transportation Benefits Equity Amendment Act of 2017. Members contacted Councilmembers Todd and McDuffie to urge their support for the legislation, which would allow employees who walk, bike or take transit to receive the same benefits as those who drive. The bill needs one more councilmember's vote to clear the Transportation and the Environment Committee. The BAC holds its bimonthly meeting on Nov. 1. Members will participate in a midmonth Anacostia River Trail ride Councilmember Silverman's office is organizing. Members will also participate in a local event observing the United Nations World Day of Remembrance for Road Traffic Victims. The details of both events are pending and will be posted when known.